Wooden Gods from Perm region, Tuvinian throat singing, an Australian version of Porgy and Bess and other events. A new and truly unique exhibition is set to open to the public in the Russian State History Museum on the Red Square. “The Christian Antiquities of the Perm Region” holds 120 pieces of Russian ecclesiastical art of the 16th to 19th centuries, including icons, pictorial embroideries of priests and overall church art. Most notably, the collection includes wooden figures, which are considered rather unique in the orthodox world. The Orthodox Church typically does not show the holy face in three dimensions. Traditionally the Orthodox Churches had always been decorated with icons and fresco paintings. Icons of the 16th to 17th centuries made by the order of the Demidov family, the famous Ural-region manufacturers, are also on display. However, it is the wooden sculptures that distinguish the Ural region from all of the Russian areas. Many different scenes from the life of the holy family are portrayed in wood – for example, baby Jesus in his cradle with Virgin Mary over him. These Perm antiquities were earlier brought to France, where the exhibition was a huge success. A concert in honor of one of the most interesting musicians from the Russian underground world, Sergei Kuryokhin, will take place in Moscow’s Gogol Center. Kuryokhin’s songs will be performed by Alexei Aygi and his ensemble 4'33, which will be accompanied by a symphonic orchestra. Kuryokhin passed away in 1996 at a young age, having already achieved a great deal of things. He was an accomplished jazz improvisator and a gifted composer, and as a skilled pianist in the 1980s he performed with the best Soviet rock groups. He also founded “Pop-mechanics”, which is neither a music band, nor a theater. It’s more like a mobile half- musical, half- theatrical project, which for many years has been changing its body and scenario. It’s all about edgy burlesque and punk art-performance. Aygi, who will perform Kuryokhin’s songs, is a well-known composer famous for writing soundtracks to many Russian movies and TV shows. His technique is usually called minimalism, and 4'33, his group, is a continuation of all the traditions set by Kronos Quartet and John Zorn. 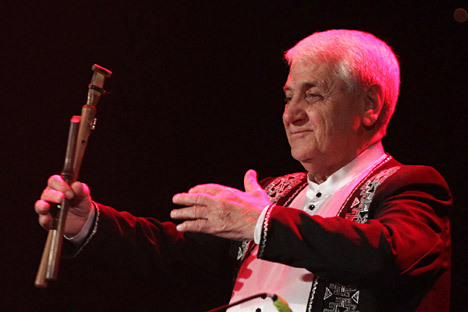 The legendary 85-year old Armenian musician Djivan Gasparyan will perform in Moscow’s Estrada theater on Dec. 19 and 21. He plays the duduk, the Caucasian folk instrument. The duduk is a pipe with nine keyholes. He earned a Golden Globe for the composition used by Hans Zimmer in this film. Gasparyan tours frequently, performing with musicians such as Peter Gabriel, Brian May and Michael Brook. Saint Petersburg’s Mariinsky Theatre will host a concert consisting of the American composer George Gershwin’s opera “Porgy and Bess.” Daniel Smith, a young Australian, will be conducting the opera. Critics say Smith is without doubt a rising star of the world stage. After his debut with the Gothenburg Symphony Orchestra, he has been repeatedly called one of the most promising young conductors. Tuvinian throat singing (khoomei) is an international musical brand, which is an integral part of world music. A special technique of throat singing lets the performer let out two or three notes at the same time. This is one of the most popular Asian traditional folk groups. They have been touring the world for nearly 20 years. Famous Buryat singer Namgar Lhasaranova will present her program “The Dawn of Foremothers” during the event.